Although continuous level measurement technologies have the ability to quantify applications for bulk solids, slurries, and granular materials, liquid level technologies stand out as being exceptionally crucial to the foundation of process control. 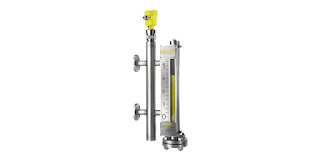 Called “transmitters,” these continuous liquid level measurement devices employ technologies ranging from hydrostatics to magnetostriction, providing uninterrupted signals that indicate the level of liquid in a vessel, tank, or other container. Differential pressure (DP) transmitters rely directly on, in a basic explanation, the pressure difference between the bottom and top of the container. Precise pressure measurement is used to determine the height of the liquid in the tank. One of the most advantageous aspects of DP transmitters is that they can be used in pressurized containers, whereas displacer and bubbler transmitters cannot. Other examples of level transmitter technologies––which are not hydrostatic devices––are magnetostrictive, capacitance, ultrasonic, laser, and radar. In magnetostrictive level transmitters the measuring device, a float, has a series of magnets that create a magnetic field around a wire enclosed in a tube. Electrical pulses sent down the wire by the transmitter head product a torsional wave related to the position of the float, which moves with changes in liquid surface level. The transit time of the torsion wave back to the sensing head is measured and the depth of the liquid, as indicated by the float position, can be determined. Radar level transmitters involve microwaves emitting downward from the top of the container to the liquid’s surface and back again; the measurement is the entire time-frame. One variable radar level measurement echoes capacitance measurements: they both involve dielectric contact of liquid. The precise measurement of transmit time for a wave or pulse of energy is employed in several of the technologies, the measurement of pressure in others. Each technology has a set of attributes making it an advantageous selection for a particular range of applications. Share your liquid level measurement challenges with an application expert, combining you process knowledge with their product application expertise to develop effective solutions.